The sweet potato vine (Ipomoea batatas) is a South American tropical plant that requires a minimum of 150 frost-free days to develop. The ideal average temperature for growing the sweet potato vine is 75 degrees Fahrenheit. It is neither drought nor flood-tolerant. Sweet potato vines are generally not troubled by pests but there are several common diseases that the grower should be aware of. Streptomyces soil rot is what is known as a soilborne disease, as opposed to a disease carried in the air or in water. Also known as pox, this disease is caused by Streptomyces ipomoea, which rots the feeder roots, causing a reduction in yield. The disease commonly attacks sweet potato vines that are grown in dry soils with a pH over 5.2. Symptoms of Streptomyces soil rot include stunted and yellow foliage and sweet potato vines that don’t produce. According to Dr. Chris Clark, professor of plant pathology at Louisiana State University, the Jewel sweet potato variety is highly susceptible to streptomyces soil rot while Beauregard and Hernandez are resistant. Prevention of pox includes choosing soils that are a bit heavier, lots of irrigation early in the season and growing a resistant variety. Treatment involves the pre-planting use of a soil fumigant containing chloropicrin, according to label instructions. Plant pathologists with the North Carolina State University Plant Pathology Extension warn that after treatment, you must wait two to four weeks to plant the sweet potato vine and it is important to remove the top 2 inches of soil that contain fumigant residue. Sclerotial blight, also known as stem rot or southern blight, is another soilborne disease caused by a fungus, Sclerotium rolfsii. Symptoms of sclerotial blight include discoloring, wilting and death of foliage and, eventually, the death of the sweet potato vine. A white fungus can sometimes be seen on the soil around the base of the sweet potato vine, especially during periods of high humidity. Management of this disease is preventive in nature: treat the seed’s roots with dicloran prior to planting and plow deeply. The fungus cannot survive being buried deep in the soil. Circular spot is caused by the same fungus, S. rolfsii, that causes sclerotial blight, but it attacks at a different stage of sweet potato development. Circular spot develops just prior to harvest, in hot weather, and attacks storage roots. It produces circular lesions on the sweet potato which may peel off after harvest. There is no treatment for circular spot. Root-knot nematode, Meloidogyne spp., is a widespread and destructive sweet potato vine disease. Nematodes are small roundworms with the thickness of a piece of thread. Some nematodes are actually good for plants, others, such as Meloidogyne, are parasites that feed on the sweet potatoes’ roots. 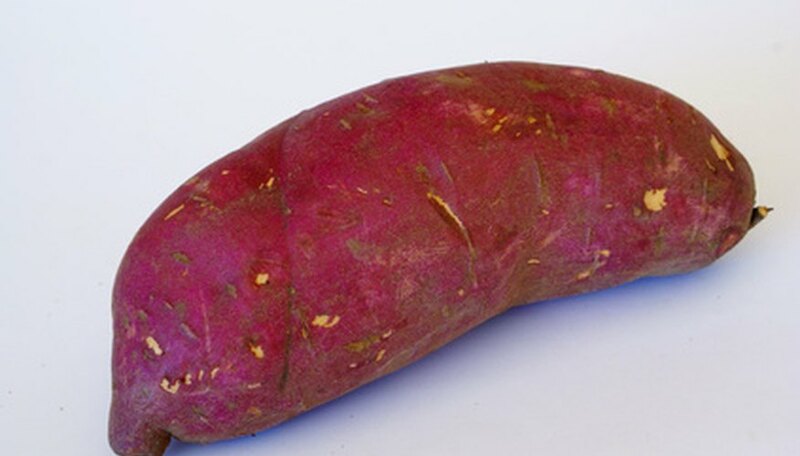 It prefers sandy soils and attacks both the feeder and the storage roots, causing cracks in the sweet potatoes. These cracks provide an entrance for fungi that will rot the tuber. Agents with the Maryland Cooperative Extension suggest purchasing varieties that have shown resistance to root-knot nematodes in your region; use good, organic soil amendments when preparing the soil; and water and fertilize consistently to keep the sweet potato vine strong.